The highest temperature found so far from a National Weather Service Cooperative Station is 62 degrees at Marshall. Both Milan and Madison in southwestern Minnesota both saw 61 degrees. An automated station near Canby in Yellow Medicine County reached 63 degrees. Looking back to 1891 this is the first time a maximum temperature reached 60 degrees in the state for the first week of January. St. Cloud saw a record high of 53 degrees, breaking the old record of 43 degrees set in 1984. Clouds held the temperature down in the Twin Cities and "only" had a high of 45 degrees. There has never been a 60 degree temperature recorded during the first week of January in Minnesota's modern climate record. The warmest temperature ever recorded in Minnesota during the first week of January is 59 degrees, occurring on January 7, 2003 in Amboy, MN. The warmest temperature ever recorded in Minnesota on January 5 is 57 degrees, recorded at Crookston in 1902. How rare is it to have a temperature of 60 degrees or higher in January in Minnesota? Reaching 60 degrees ANY time ANYWHERE in January is quite rare, occurring in only 10 years of the 120 year modern record. The all-time record high temperature for any day in January is 69 degrees, occurring January 24, 1981 in Montevideo. January 6 Update: See the following post for Minnesota temperature records. In North Dakota, all-time January high temperature records were set at Minot and tied at Jamestown. Both previous records were over a century old. 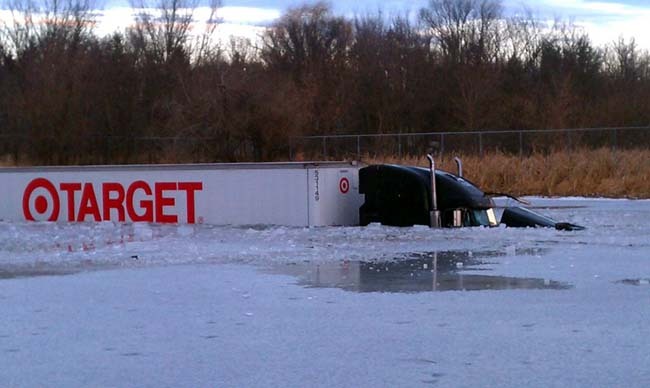 FARGO. IT WAS 54 DEGREES ON JANUARY 20 1908. IN GRAND FORKS. THE PREVIOUS RECORD WAS 42 DEGREES ACHIEVED IN 1984. 9 PM Update: The Rapid City airport temperature peaked at 73°, smashing the old record of 60° in 2008. East Rapid City, where records extend back to 1888, hit 71°. TODAY. THIS BREAKS THE OLD RECORD OF 55 SET IN 1903. A RECORD HIGH TEMPERATURE OF 58 DEGREES WAS SET AT BISON TODAY. THIS BREAKS THE OLD RECORD OF 50 SET IN 1958. TODAY. THIS BREAKS THE OLD RECORD OF 61 SET IN 1930. TODAY. THIS BREAKS THE OLD RECORD OF 47 SET IN 1903. AIRPORT TODAY. THIS BREAKS THE OLD RECORD OF 57 SET IN 2003. TODAY. THIS BREAKS THE OLD RECORD OF 47 SET IN 2006. A RECORD HIGH TEMPERATURE OF 71 DEGREES WAS SET AT FORT MEADE TODAY. THIS BREAKS THE OLD RECORD OF 62 SET IN 2001. TODAY. THIS BREAKS THE OLD RECORD OF 46 SET IN 2002. A RECORD HIGH TEMPERATURE OF 61 DEGREES WAS SET AT LEAD TODAY. THIS BREAKS THE OLD RECORD OF 55 SET IN 2001. RECORD WAS 55 DEGREES SET IN 1956. RECORD WAS 61 DEGREES SET IN 1956. DEGREES...ESTABLISHING A RECORD HIGH FOR JANUARY 5TH. THE PREVIOUS RECORD WAS 62 DEGREES SET IN 1956. KEARNEY REGIONAL AIRPORT...REPORTED A HIGH TEMPERATURE OF 69 DEGREES. HASTINGS DATE BACK TO 1906. TEMPERATURE FOR JANUARY 5TH IN BROKEN BOW IS 37 DEGREES. FOR THIS DATE INTO PERSPECTIVE. IMPERIAL MUNICIPAL AIRPORT ON THURSDAY AFTERNOON...JANUARY 5TH. TEMPERATURE FOR IMPERIAL ON JANUARY 5TH IS 41 DEGREES. While some cold records were being set in parts of the Southeast yesterday, January heat records have been absolutely crushed in the Northern Plains this afternoon. The National Weather Service reported in the past hour that Aberdeen, South Dakota, where climate records date back over a century to 1896, surpassed its previous all-time record high for the entire month of January by 3° with a reading of 63° at 3:10 pm CST. The old record of 60° was last set on January 24, 1981. Today's record also incinerates the old daily record for January 5 (46°, 1935) by the unbelievable margin of 17°. Sioux Falls, South Dakota has also set a daily record by an amazing amount, considering that records began there as far back as 1893. The new record of 62° exceeds the old record (49°, 1985) by 13°. Yesterday's high of 54° at Sioux Falls also tied a daily record set in 1916. 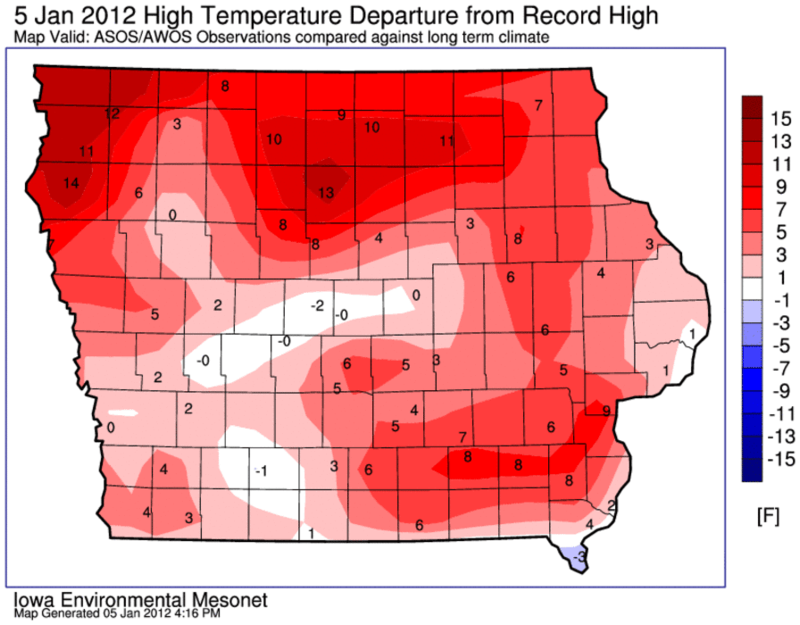 Yet another long-standing record fell at Huron, South Dakota. The high of 65° exceeded by 18° the old record of 47° first set in 1898 and tied in 1935. 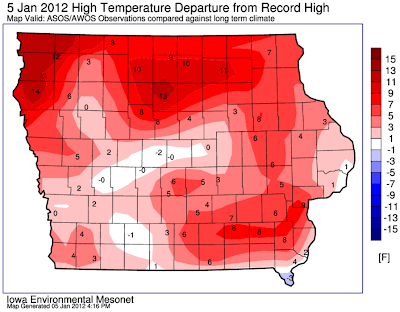 This was also an amazing 39° above normal and an even 100° above the record low for the date of -35° set back in 1884. 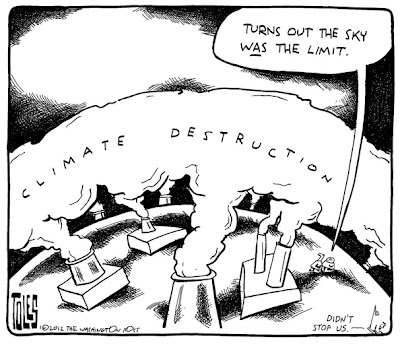 Climate records began there in 1881. At Mitchell, South Dakota, the high of 68° was 17° above the old record of 51° set in 1935. It was also an incredible 41° above normal. Records began at Mitchell in 1893. Rapid City, South Dakota, records extend back only to 1942, but the high temperature of 66° had already broken the daily record by 6° as of 11 am this morning. Temperatures there have reached at least as high as 70°F at 1 pm MST. Records also extended southward into Iowa, where Sioux City set a new high of 68°, easily exceeding the old record of 61° in 1956. Records there date back to 1889. 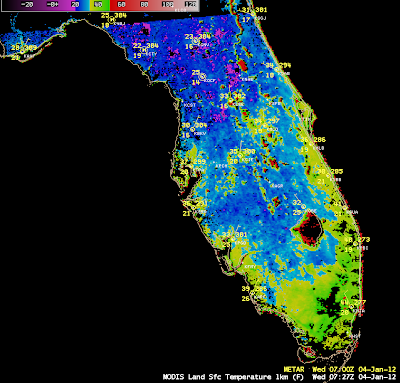 The 1918 records in southern Florida remained intact, however, as Ft. Lauderdale missed its record of 32° by 10°, and Miami missed its similar record by 11°. 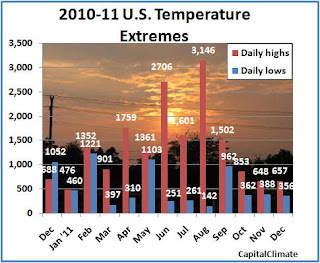 Aided by a strong warm surge toward the end of the month, new U.S. daily high temperature records exceeded daily cold records in December by a ratio of 1.8 to 1, a margin of 80%. The overwhelming excess of heat records continued into New Year's Day, when the 116 high maximum records set or tied absolutely crushed the one lonely low minimum record (at a co-operative station 3 miles northeast of Marlin Texas). 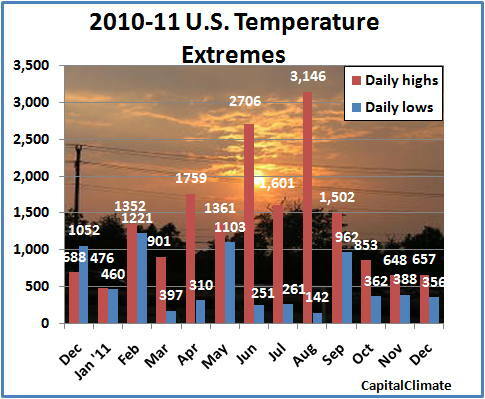 The December high/low record ratio was equal to the ratio for the preceding fall season, but the extreme summer ratio of over 11 to 1 pushed the annual value to 2.8 to 1, well above the 2.3 to 1 in 2010. 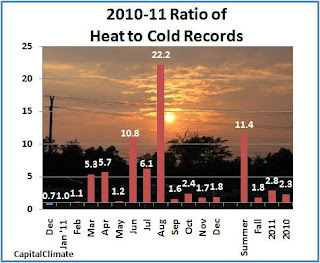 Although January's heat records were only about 4% more numerous than the cold records, the ratio was over 1 for every individual month in 2011. The last time cold records exceeded heat records in a month was a year ago, in December 2010. Preliminary data from NOAA/ESRL show that U.S. December average temperatures were noticeably below normal only in the desert southwest and parts of Texas. Elsewhere, temperatures were as much as 6°C (nearly 11°F) above average in North Dakota and western Minnesota. To the north, temperatures ranged even higher relative to average in western Canada, as high as 8°C in some areas. December temperatures were also quite warm across nearly all of continental Europe. For 2011 as a whole, U.S. temperatures averaged above the new 1981-2010 climatological base nearly everywhere east of the Rocky Mountains. The heat bullseye was centered in the drought areas of Oklahoma and northern Texas. The coldest areas relative to average were in the Pacific Northwest and California.